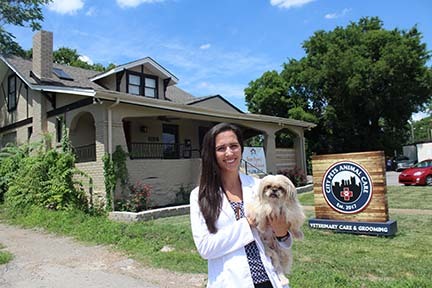 NASHVILLE, TN — A day in the life of Eva Evans, pet doctor, might start by mowing the lawn in front of her City Pets Animal Care clinic on Jefferson Street. A couple of years ago, Dr. Evans’ days led to an after-hours emergency clinic and critical care for pets in Nashville. Her first day of spring this year included Carmen Fournier and check-ups for Fournier’s Chihuahuas, Izzi and Evie. Dr. Evans has three dogs. Roxy and Mazie are Boston Terriors. Sofie is a Pekingese, a foster dog that was to be euthanized because of heart worms, dry eye, tooth abscesses and diabetes after being used as a puppy mill’s breeding dog. Evans opened her clinic at 1016 Jefferson St. on April 10. It’s the first animal hospital and veterinary practice in that area for decades, according to Dr. Mack Scott DVM, who retired in 1996 from Meharry Medical College where he ran a clinic. Dr. Evans was eight years old when she decided to be a veterinarian. “I grew up on a farm in Joelton with horses, rabbits, cats and dogs, and goats … enjoyed them, and decided it would be nice to do that permanently,” Evans says. She graduated from Martin Luther King Jr. Academic Magnet High School where she studied physics, chemistry, biology and other academics needed to enter colleges to become a vet. “You don’t have to be zoned to go” to MLK Junior, she said. “It was just a long drive every day.” Her parents made the decision on where she could get the classes she needed, and her mother drove her to school. Unlike the influx of out-of-towners who move here to open a business, Dr. Evans is returning to a neighborhood that’s part of her life. She graduated from the College of Veterinary Medicine at the University of Tennessee, Knoxville, in 2012 and earned her masters of business administration from the University of Maryland in 2015. 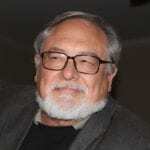 Dr. Evans worked at a private animal practice for two years in Las Vegas, Nev.
Dr. Evans recommends vaccination of city dogs against lepto (leptospirosis), a bacterial infection of spiraled cells — threatening kidney and liver failure — spread by mice and rats’ urine, through skin to blood and possibly humans. She also offers vaccine titer tests of blood to measure antibodies to disease, thereby avoiding redundant vaccinations. Cold laser therapy, cryosurgery, acupuncture, digital radiography, dental x-ray, in-house laboratory testing, pain control, hospice and house calls for disabled pets and owners are also available.